Mona Pavilions provide contemporary-designed sophisticated accommodation on the outskirts of Hobart, Southern Tasmania. The eight pavilions sit on a three-and-a-half hectare private peninsula overlooking the Derwent River. Choose from one or two bedroom configurations, each showcasing private artwork from the Mona collection. 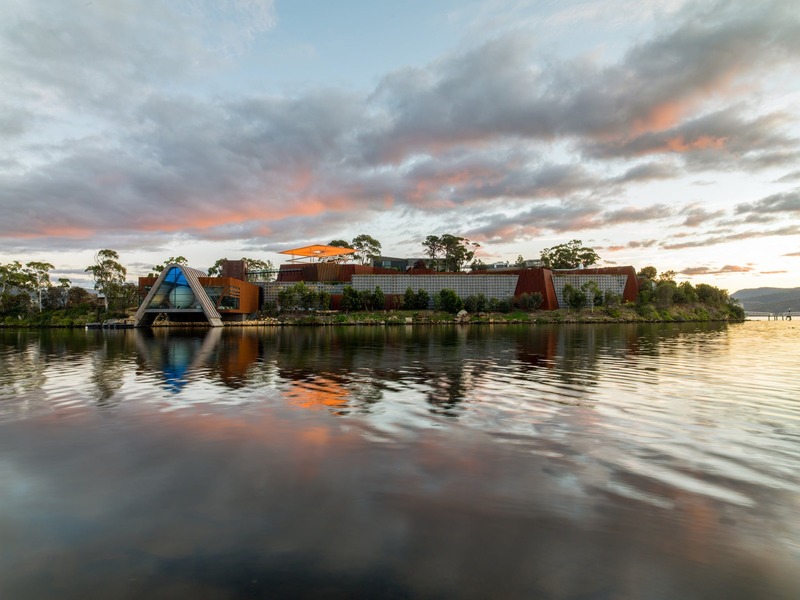 Four pavilions are named for architects including Roy (Grounds), Robin (Boyd), Esmond (Dorney) and Walter (Burley Griffin) who have influenced Australia’s architectural landscape while others are named after Australian modernist painters. They feature double spa baths, contemporary bespoke furniture by Tasmanian designers, furnishings from the likes of Philippe Starck, Patricia Urquiola and Ron Arad, and state-of-the-art kitchens. Each has a private cellar stocked with Moorilla wines and Moo Brew beer and access to the heated infinity pool, sauna and gymnasium. Australia’s largest private museum, Mona, opened in early 2011 and guests have access to their choice of online imagery streamed from the Mona collection. Entry to the Museum is free for Pavilion guests. Experience the unique combination of fine accommodation and avant-garde art, coupled with The Source Restaurant and winery onsite. Mona is just a 15-minute drive (12 kilometres) from central Hobart.